But "wait," you might be saying. "I don't put sugar in my coffee, and a vanilla bean? Come on. This isn't Starbucks. 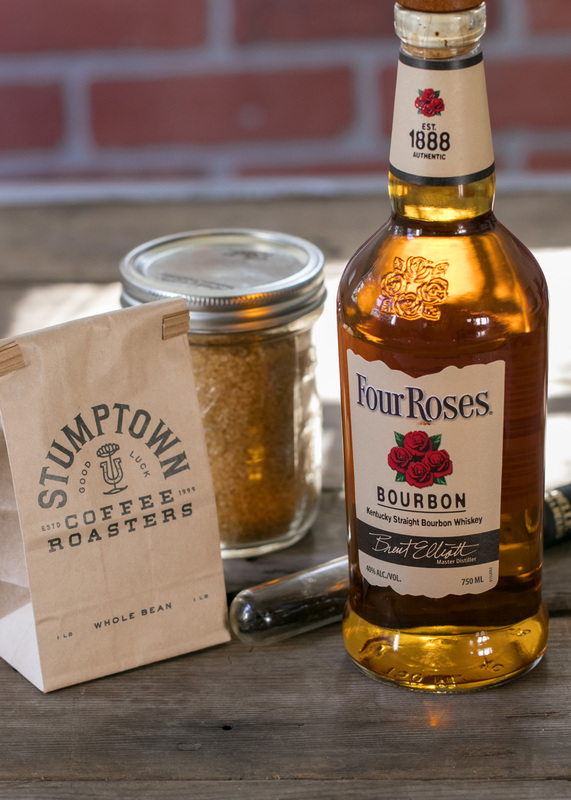 We're talking about coffee and whiskey here, not some fancy solution you whip into a latte." I hear you, and I agree. But trust me. After three weeks of infusion, this stuff shows the maximum depth of the key ingredients. 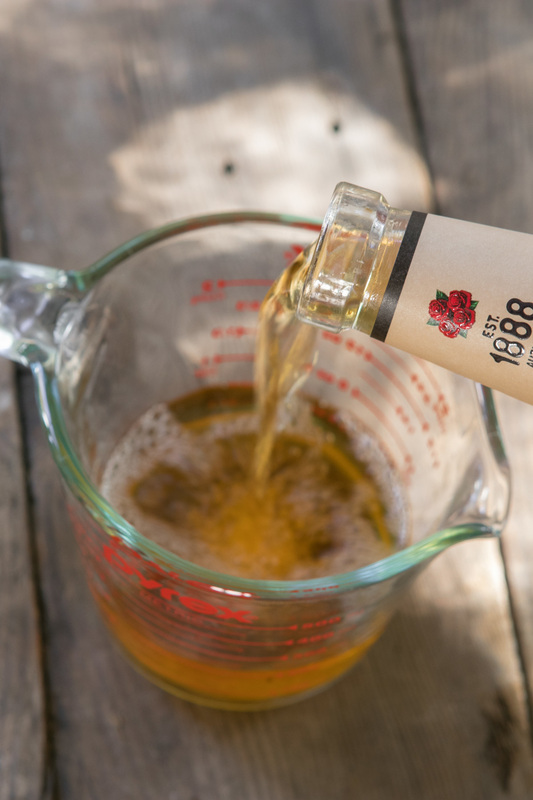 The sugar is there to bring the two together, providing a rounder flavor that's more than just the sum of the parts. And the vanilla bean helps accentuate the barrel-aged flavors of the bourbon... which, after all, are called vanillins. 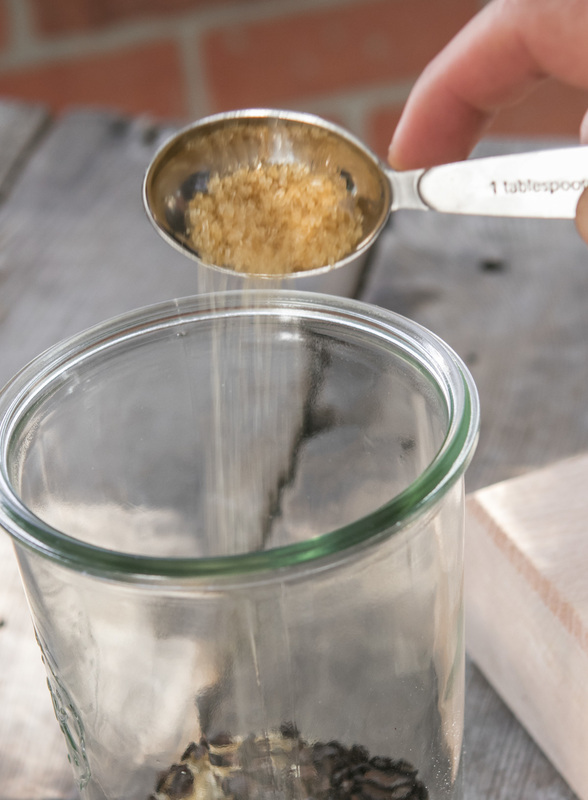 These two extra ingredients help transform the infusion from an intense, bitter concentrate to something you can easily sip smoothly or toss in a mug of hot coffee to enhance the experience. It's not sweet, it's not perfume-y. It's just good. Also, note: I recommend using decaf beans here. 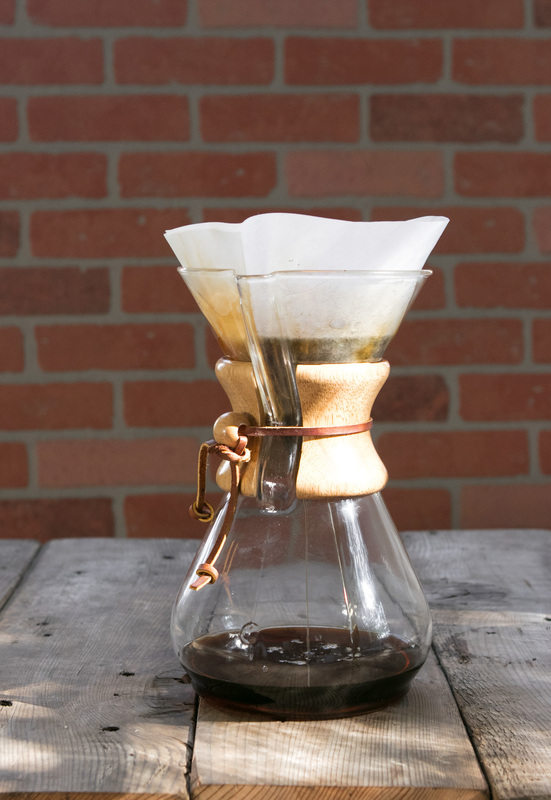 There's not a ton of actual coffee in the mix, but as it will most likely be consumed after 5:00pm, set yourself or your friends up for a better night's sleep by avoiding the caffeine. 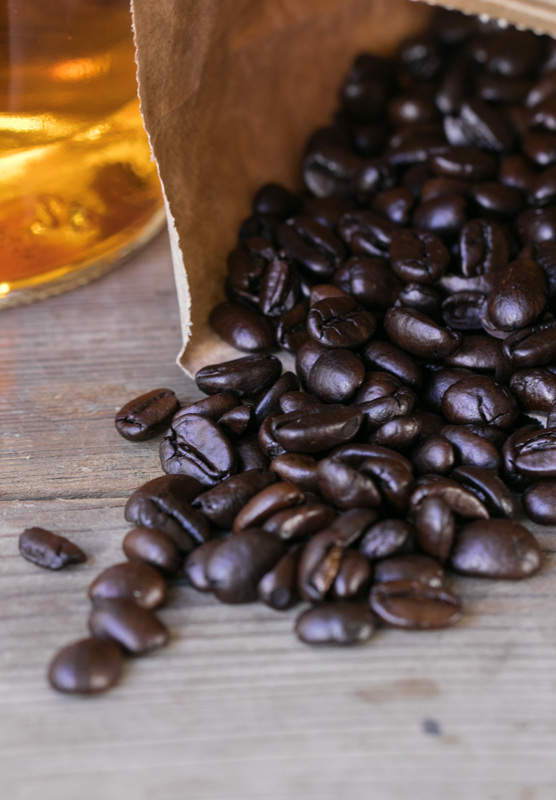 You can get nice whole decaf beans (and not have to buy a full bag) in the bulk section of a grocery store that sells things like organic produce. There's only fifty cents or a dollars worth of coffee here, so it's worth seeking out something of quality. 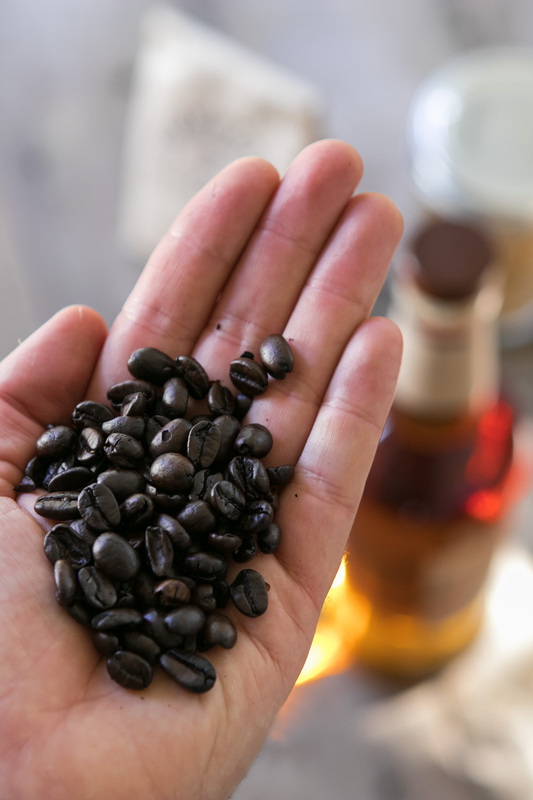 Begin by measuring out your coffee beans. A scale helps if you have one, but if not, a 1/2 oz (16 grams) is about 1/3 of a cup. Maybe 50 wholes beans or so. 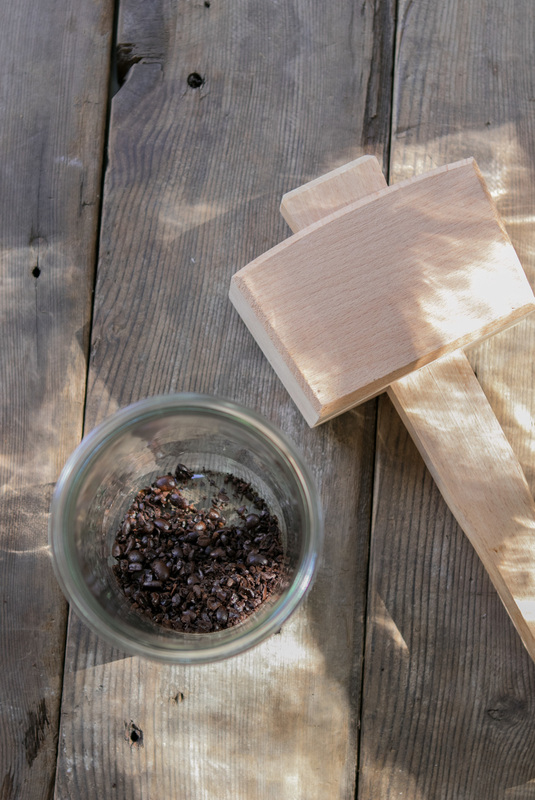 Place the beans in a bag or towel, and give them a few whacks with a wooden mallet, a rolling pin, or the bottom of a skillet. Breaking them up exposes more surface area and maximum flavor exchange. 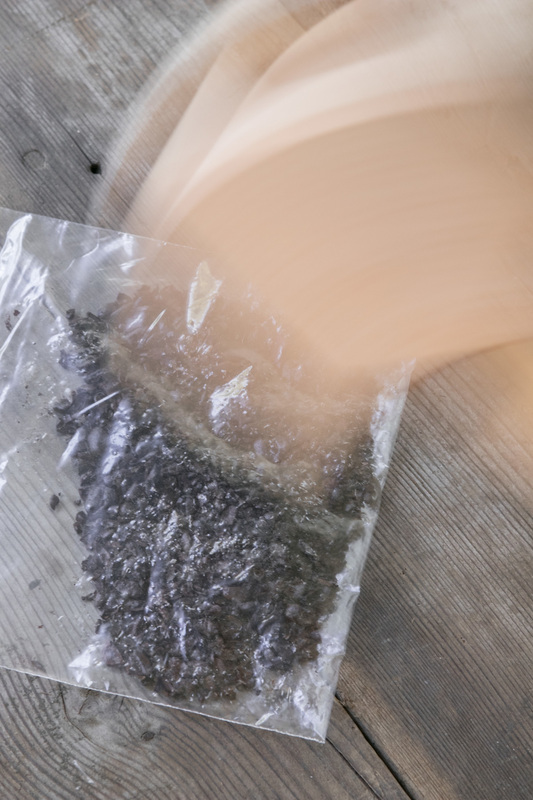 Don't grind things too finely, as we don't want any particulates in the final product. ... then pour in the sugar. 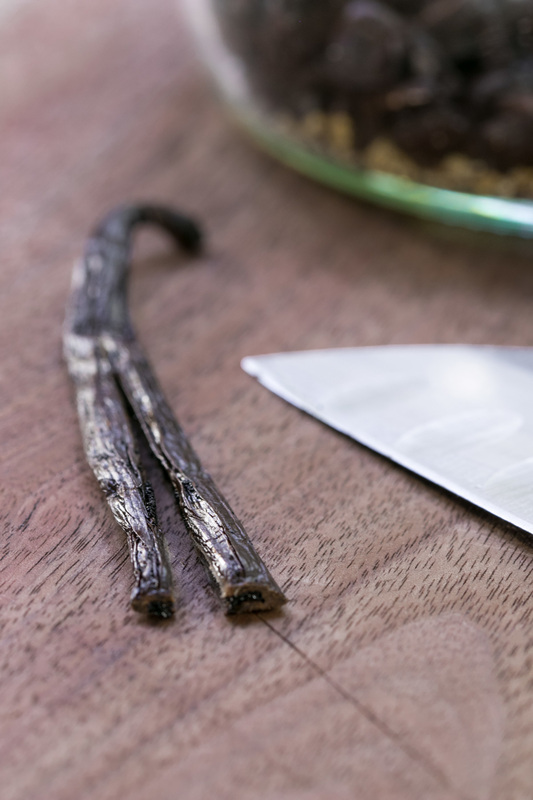 Cut a whole vanilla bean in half, then split it along its length to expose the good parts inside. Add it to the jar. 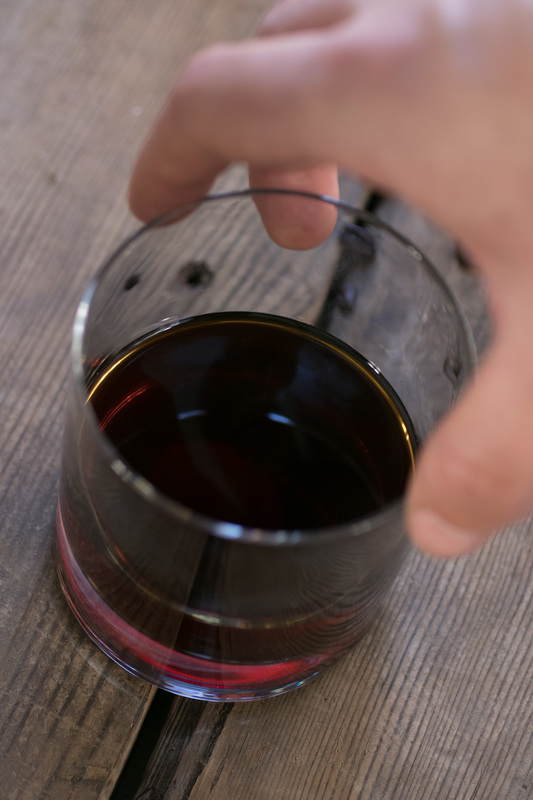 Measure out a cup and a half of bourbon. This doesn't need to be super fancy stuff, but should be something you'd enjoy drinking neat. A $15-20 bottle works great. 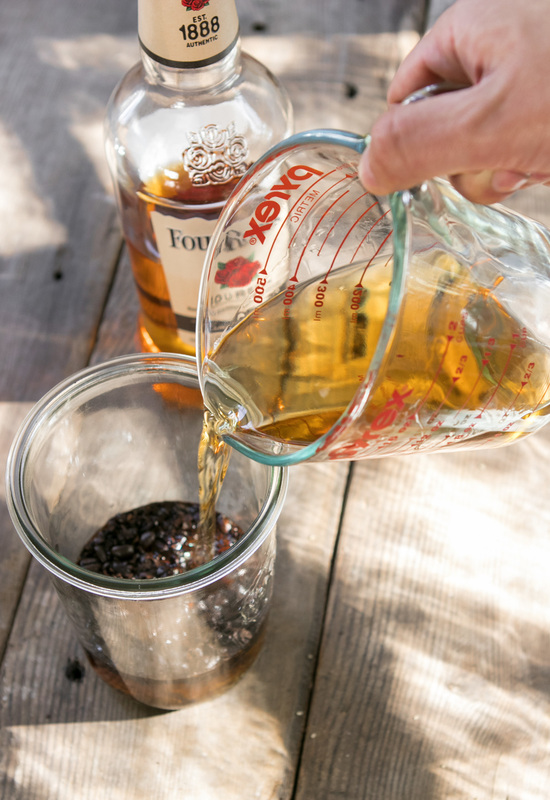 Add the bourbon to the jar, attach the lid, and shake everything up thoroughly to combine. Now, set it in a cool place, away from direct light for two-three weeks. A basement or closet works great, or you can place the jar in an opaque paper grocery bag before storing. If you can, give it a shake every once in a while to mix things up. I set alerts on my Google calendar to help remind me to stir it, and when to deal with it when the infusion is done. After all the magic has happened, the liquid will be considerably darker, the color of coffee. All you need to do now is remove the solids inside. 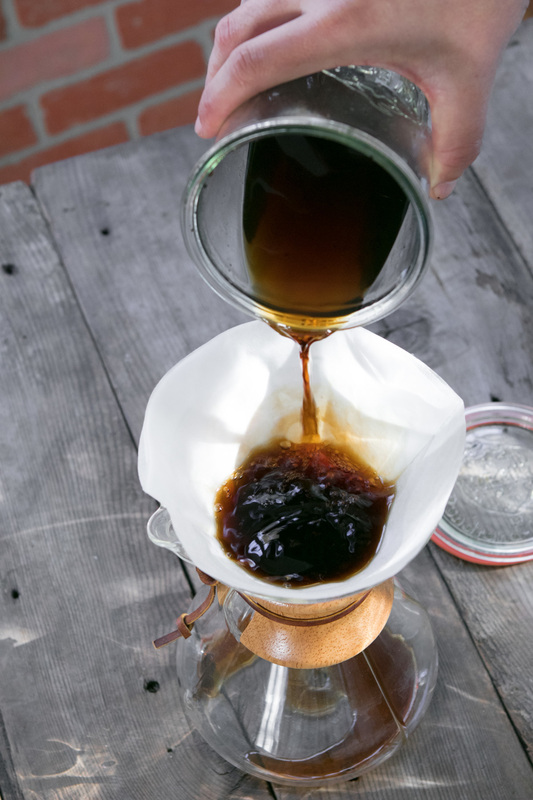 The easiest way is with a coffee filter. Find a way to suspend your filter (a pourover setup is ideal, but a bowl and some binder clips work great too) and dump all the contents in. 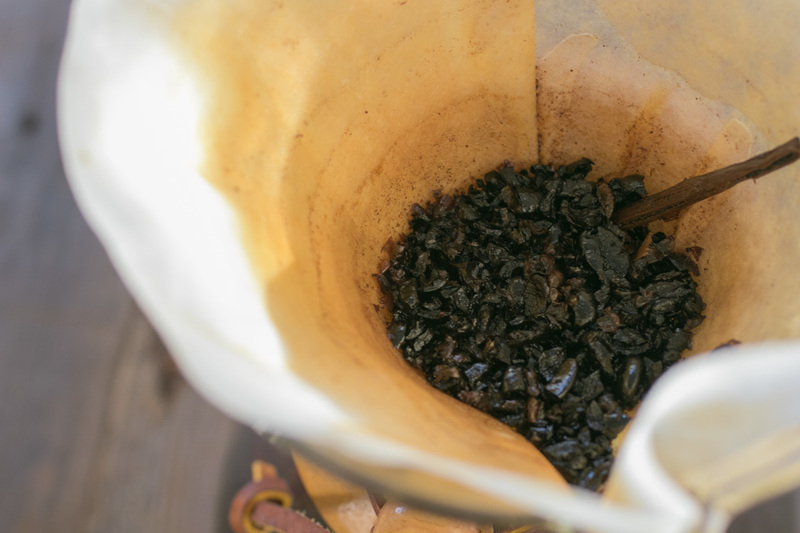 You can use a French press to remove the big parts, but you'll need a finer filter to finish the strain. However you get there, it will only take a few minutes to completely drain. Press down on the solids to get any remaining liquid out. 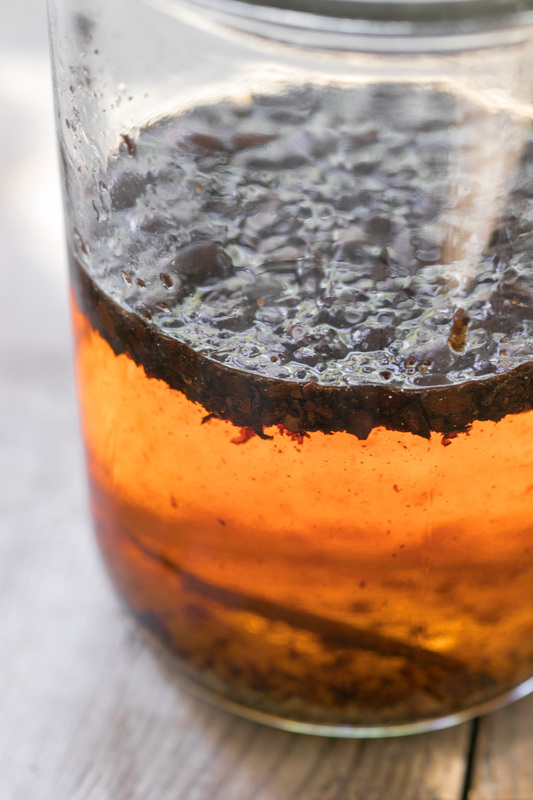 You can save the vanilla bean and toss it in your morning brew sometime. It will be delicious. This is obviously a recipe that can be doubled or tripled, if you want to make it in large batches to give as gifts. Use the metric measurements above for easy conversion. 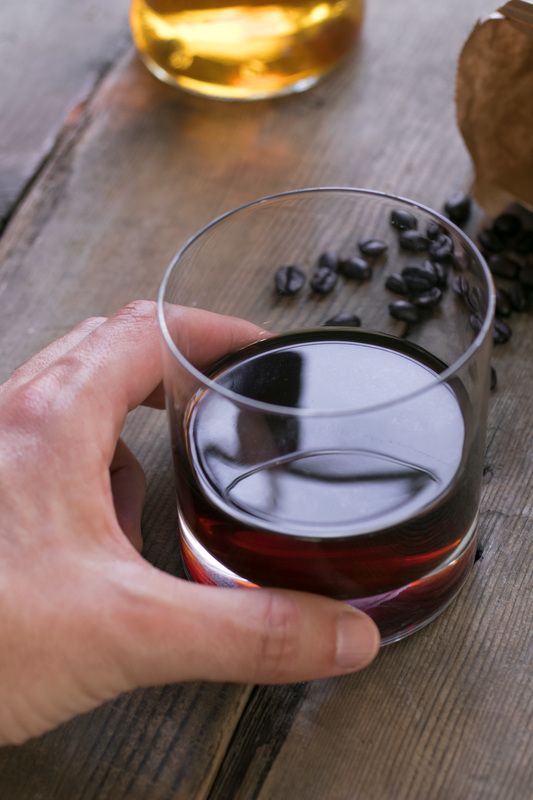 You can use this in place of any coffee-based liqueur in a classic cocktail, like a White or Black Russian. 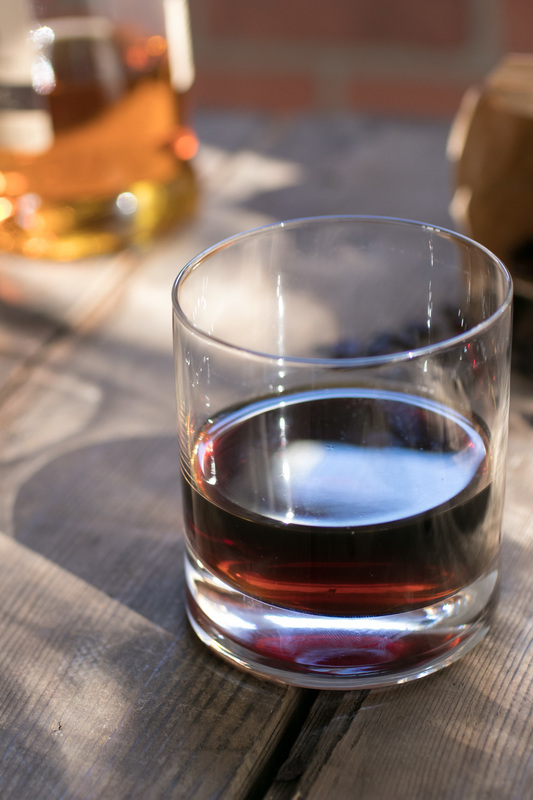 It will be higher-proof than Kahlua, so plan accordingly. I'd also recommend sipping it neat by the fire, perhaps mixed with a splash of fresh bourbon to even things out or to make it last longer. I will also be pouring over a large ice cube with an orange twist, as one would enjoy an amaro. 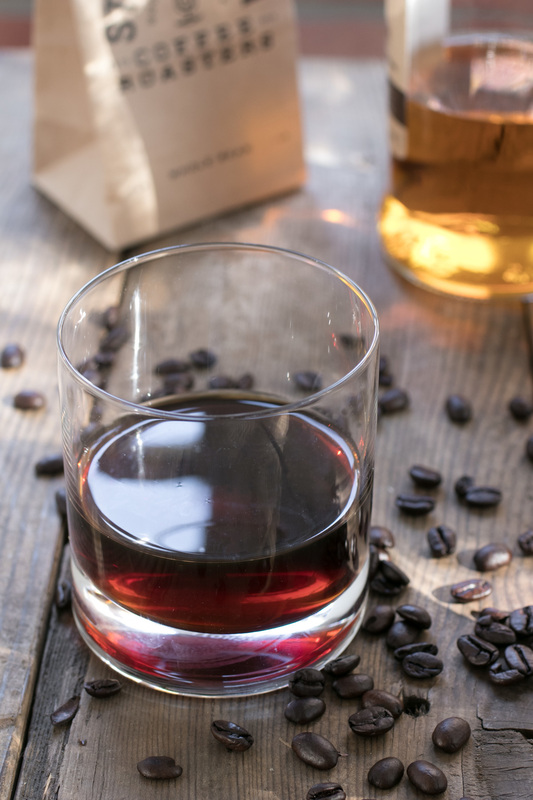 Mostly, it tastes really, really good in coffee, whether a Spanish coffee mixed with flammable spirits, or just a dash added to a steaming hot cup on a special winter morning. I would (and will) definitely add this to the decaf I'll be enjoying alongside my Thanksgiving dessert. So, give it a shot. You have plenty of time to get the infusion going before the holiday season, and it makes a great last minute food gift to give to friends. If you don't get enough of a head start, just tie on a coffee filter and put a "ready to drink by" label on it to let them know when it'll be at its peak. Cheers. OMG i'm completely blind. Nevermind! I bought a (very expensive!) vanilla bean to try this out, in future batches do you think I'd get the same result using pure vanilla extract? If so how much would you say? @Steve - The "ready by" date suggestion was if you wanted to make this as a last minute holiday gift. If you didn't plan 3 weeks ahead, you could still give this to someone in a mason jar with a coffee fiiter, and just say "This will be ready to drink on January 5" or similar. @Obun314 - I just finished making mine, so its still fresh, but my guess is: it's probably indefinite. I'll definitely finish mine before the holidays are over. There's no water or other ingredients that can go bad in there, and the alcohol should prevent anything from growing. What is the "ready by" date for? And how long can it lay around before it goes bad? Sounds awesome, I'll definitely try it!